What do our local owls eat and how do they digest it? 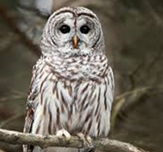 Join us at Grass River Natural Area on Saturday, November 10th at 1 pm as we learn the science of our owls and owl pellets and get the chance to dissect your very own to learn what these owls have been hunting for! This 1.5 hour program is $5 per participant. For more information visit grassriver.org. The entrance to Grass River Natural Area is at 6500 Alden Highway, Bellaire.